We've been avoiding geocaching in the winter. After all, it's cold. But today was beautiful. A balmy 30 degrees which, to Minnesotans, is almost like spring. I'm surprised no one was grilling in their back yard. So Eryn and I hit a nearby lake to look for a geocache in the snow and the dark (i.e. about 4:45 p.m.). 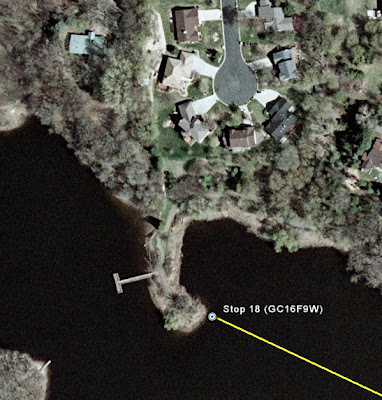 Here you can see where we went (thanks to Google Earth). Except there was no greenery, it was all white, and we didn't walk across the lake (despite the ice). We walked along the shoreline from the far right and then onto the penninsula, leaving my car on a slope that looked like I was inviting the lake to swallow my non-pedal-powered means of transportation. We traded a large paper clip for a trackable geocoin from Canada (PCV118) sporting a potato with a hat and beer that reads "Off the couch...on the trail". I figure that will force us to go geocaching again soon so that we can drop the coin off someplace new.